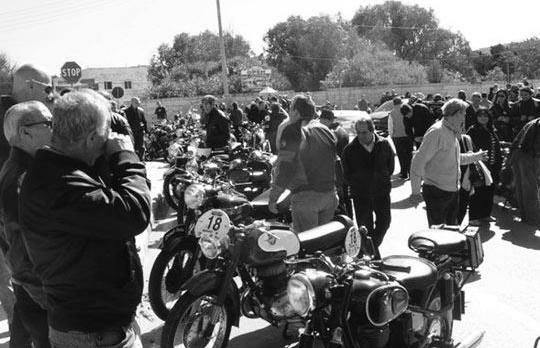 Another very successful International Classic Motorcycle Weekend, organised by the Historic Motorcycle Club-Malta, has come and gone. Months of effort by the club's committee and members has paid off. Around 42 Italian classic motorcycle enthusiasts riding 27 very interesting machines spent three days - and their money - among us. But what is so special about a few visiting tourists out of over 1.2 million who grace our shores annually? Why all the fuss? Well, it can be said that this international rally and others like it that may be organised in future was the indirect result of a collective effort by many unseen players. The Federazzjoni Maltija Vetturi Antiki (FMVA), former and incumbent ministers as well as officials from Transport Malta and the Ministry of Finance were all indirectly involved. The FMVA is comprised of the Historic Motorcycle Club, the Old Motors Club and the Military Vehicles Collectors Club. We represent the overwhelming majority of classic, vintage and veteran vehicle enthusiasts in Malta and have lobbied long and hard since 1998 to obtain favourable concessions for authentic classic vehicles owners. The federation has always argued that by granting favourable concessions, the government would be promoting classic vehicles in Malta. We said that reducing road licences and first registration fees might appear, at first, to curb government income (it didn't actually happen) but that in the long- term the country as a whole would benefit. We said that helping owners keep their authentic classic vehicles alive and on the road, as opposed to keeping them squirreled away in some dark garage, would maintain an essential "critical mass" that would eventually help local charities, special-interest tourism, possible classic vehicle repairs in Malta, film facilities and others. Thankfully, after countless meetings spanning several years, former ministers Ċensu Galea, Jesmond Mugliett, John Dalli and current minister Tonio Fenech eventually agreed. In 2003, for the first time ever, half-price road licences were granted to authentic classics. Other breakthroughs were to follow - such as the re-licensing of "undocumented" vehicles resulting in the resurrection of so many vehicles that were hitherto feared lost forever. Today the classic vehicle movement in Malta is much healthier and more vibrant than it was a decade ago. Existing clubs have grown, others have sprouted - but we can achieve so much more. The FMVA envisages a scenario where, given the right conditions, Malta can become an important Southern European/Mediterranean classic vehicle hub. There is no end to the number of classic tours, rallies, grand prix, international exhibitions and such that could be organised here such as, for example, the Valletta Grand Prix to be held on May 8 and 9. We have the weather and the tourism infrastructure so all we need is the will to set the wheels in motion. Such a scenario could also generate a healthy demand for high value-added repairs and restorations of classic vehicles here in Malta. The skills are present so why not market them? Prior to the Historic Motorcycle Club's efforts, the average Italian classic motorcycle enthusiast planning his touring holiday would simply look north towards other European destinations. It would never even cross his mind to consider Malta. But we've now broken the ice. Some of the participants of the above-mentioned International Classic Motorcycle Weekend were repeat visitors from last year's event. All enjoyed themselves so much, that many said they would return and even tell their friends. A few even wanted to know about purchasing property in Malta. The opportunities are there for those who can envisage them. But classic vehicle enthusiasts need more help and favourable concessions to help keep the ball rolling. The FMVA now looks forward to new and more far-reaching discussions with the authorities, which we hope will help us reach this aim.